Join John Dear on a journey of peace to Northern Ireland, June 12-20, 2019 -- places are limited, register now! 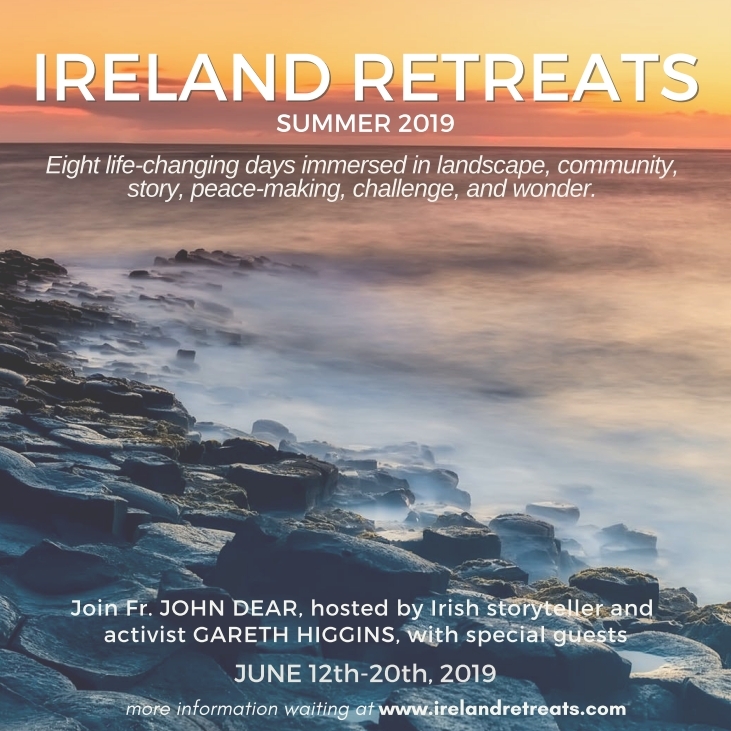 Pace e Bene friends are invited to spend eight days immersed in the beautiful Irish landscape, community, music, and poetry as we hear stories of peace and struggle with John Dear and his friend, northern Irish storyteller and activist Gareth Higgins, June 12-20, 2019, in Northern Ireland. Gareth grew up amidst the conflict and eventual peace building process in Northern Ireland, and he hosts these retreats every summer. John lived in Northern Ireland in 1997-1998, and worked at a human rights office in Belfast. Click here to read all the details and register at www.irelandretreats.com. "The story we tell shapes the world we live in. “The story of Ireland, north and south, is full of light and shadow, mystery and earthiness, sacred and profane, collaborating to create a land of charm, beauty and inspiration,” writes Gareth. “I invite you to take time out to experience the landscape, art, people and story that has captivated so many. Journey with a small group of new friends in the north of Ireland, among people seeking space, rest, challenge and clarity for the next steps in life. On our retreats we hear from politicians, activists, writers, musicians, and other artists; guides who have been immersed in spiritual reflection, peacemaking, and imagining a better world. I'm delighted to welcome my marvelous friend John Dear as special guest on this retreat, and invite you to experience the extraordinary physical landscape, learn from people who made peace with each other after a centuries-old conflict, and go on an inner personal journey that might last a lifetime." During this pilgrimage, we will stay for four nights in historic cottages in the Mourne Mountain region, and four nights in a Victorian-era country house a few minutes' walk from Belfast Lough; we'll visit Belfast, Kilkeel, Newcastle, Downpatrick and sites associated with St Patrick, and other significant places in the history of spirituality and conflict transformation. We will also spend an afternoon with John’s close friend, Mairead Corrigan Maguire (subject to schedule), winner of the 1976 Nobel Peace Prize. John edited her collected writings, The Vision of Peace, available from Wipfandstock.com. Folks who have attended these retreats in the past have often extended their trip, or come early, to visit other parts of Ireland, Great Britain, and Europe. We're happy to advise on itineraries. All the details are available at www.irelandretreats.com - places are extremely limited, so we encourage you to register now. Join us!